The least known, most important fact you need to know! When urine burns grass, killing it leaving brown patches, you know the horse has ingested too much protein. Another issue with Lucerne is it has a high phytoestrogen content. In this respect it is similar to Clovers and has the potential to upset the cycling of mares and cause other reproductive problems. Yet another issue is the fact that Lucerne, like Clover, is high in photodynamic (fluorescing) pigments which are the real cause of sunburn and mud fever. Not so widely known is the most important fact that Lucerne is high in potassium and extremely low in sodium. Being a legume, Lucerne stores sodium in the root nodules so there is virtually no sodium in the above ground portion of the plant. Apparently it is generally known in the farming community that whenever Lucerne is fed to stock they should also be fed sodium (as salt)! The trouble is nobody told the horse people! 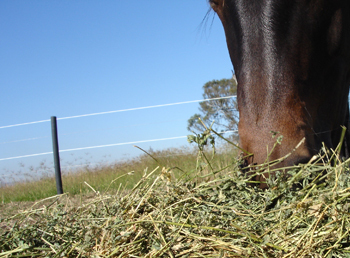 There is a lot of information out there regarding the benefits of feeding Lucerne to horses but not one that mentions this crucial piece of information. This is why a lot of people have observed that Lucerne sends their horse nuts! Most peoples horses are already getting an overload of potassium from green grass they are on. Adding Lucerne, molasses, kelp, protein meals and many herbs on top of their pasture grass has a cumulative effect, which creates serious mineral imbalances. Remember, you will need to adjust sodium (as salt) intake accordingly. Most importantly, look at how it will or will not fit with what else the horse is eating on a daily basis. From a nutritional point of view, for the recreational horse owner in particular, the disadvantages outweigh the advantages and there are other options to feed that don't create complications. Nitrate Toxicity and Sodium Deficiency Associated with Hypomagnesemia, Hypocalcemia and the Grass Tetany Syndrome in Herbivores by T.W. Swerczek, DVM, PhD. Grass Tetany by André Voisin - read Grass Tetany e-book. Poisonous Plants in the Pasture: A Horse Owner's Guide by Dr. Deb Bennett, Ph.D. available from Gotcha Equine in CD Rom format. Feeding and Nutrition: The Making of a Champion by John Kohnke.